Who should not use Fucidin Cream? Are there any medications that interact with Fucidin cream? Fucidin cream or ointment is an antibiotic treatment that contains the active ingredient sodium fusidate. It is used to treat many types of skin infections, such as impetigo, dermatitis and infected chickenpox blisters. The antibiotic contained in the cream works by fighting the bacterial infection by blocking the production of proteins that bacteria need to reproduce. 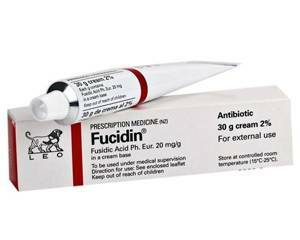 Fucidin cream is an effective treatment of bacterial skin infections and usually makes a noticeable difference in the appearance of the infected site within a few days. Always wash your hands thoroughly with soap and hot water before applying the Fucidin cream. Apply a thin layer of the cream to the affected area and gently massage into the skin. You may have to do this three or four times a day until the infection has cleared. Always follow the exact instructions provided by your doctor. If your doctor has applied a gauze dressing to the infected site, you may only have to apply the cream a couple of times a day. If you forget a dose of Fucidin cream, do not be tempted to apply a double dose to compensate for the missed one, but continue with the next one at the usual time. Please not that it is also important to remember to wash your hands after applying the cream and to avoid contact with eye, nose and mouth area. Store the medication at room temperature in a secure, dry place that is safely out of the reach of children. Allergic to lanolin (which is present in the ointment form of the treatment). Fucidin cream should not be used during pregnancy. If you become pregnant whilst taking the medication, please seek medical advice immediately. Fucidin cream should not be used whilst breastfeeding as the active ingredients can pass into the mother's breast milk and may affect the baby. Seek medical advice to find out whether it is safe to continue breastfeeding whilst using this treatment. As with most medications, Fucidin Cream can cause side effects. If you are worried about the side effects caused by the application of the Fucidin cream, do not hesitate to consult your doctor. Protease inhibitors, such as indinavir, ritonavir, and atazanavir; and Penicillins, such as ampicillin. Continue taking your medication(s) as originally prescribed. It is always important to fully disclose all your medications to the treating doctor.